Advanced TV is the umbrella that covers newer ways to reach TV audiences with more specific targeting opportunities, whether that be across screens, across devices, on the web, or on your app, all overlaid with 1st, 2nd, or 3rd party data. Yes, linear TV has limitations and is still the most viewed model, but advanced TV brings so much more targetability, measurability, and message relevance. And, if you target adults 18-34, Advanced TV tactics are necessary within your media plan. Cord-cutters are growing, and you need to reach them too. 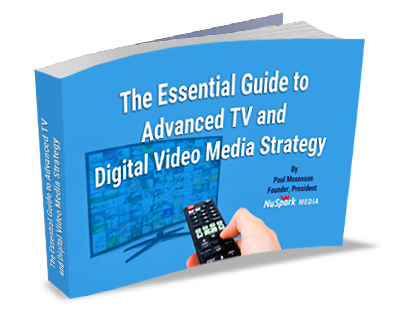 Download The Essential Guide to Advanced TV and Digital Video Media Strategy and take a visual journey through advanced TV, digital video, and social video opportunities, and learn about new tactics that can grow your business. The eBook combines our own insights with insights from the major advanced TV platforms and data companies. Together you will feel more comfortable on the tactics and benefits as you page through this comprehensive eBook. NuSpark Media is a new kind of media buying agency; one that is on the forefront and ready to step in, evaluate your current media plan (traditional and digital), roll our sleeves up, and start increasing your ROI on media. Founded by Paul Mosenson, a national thought leader on media strategy and long-term advertising executive, we are well-equipped to handle all aspects of B2B and B2C media buying and media measurement, covering traditional, digital, search and social advertising.